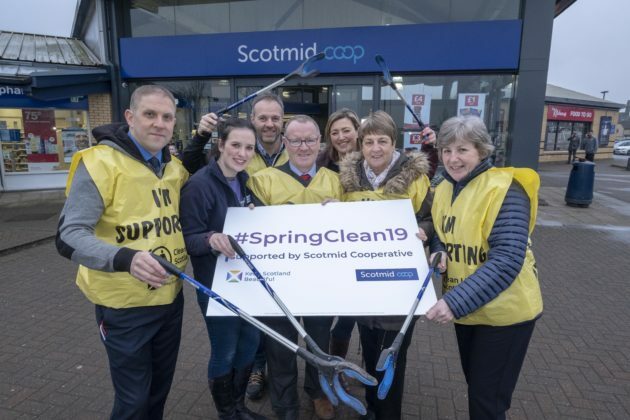 Scotmid Co-operative are proud to support Keep Scotland Beautiful’s Spring Clean campaign, the annual initiative which attracts tens of thousands of people to help clean up Scotland. The launch event at Scotmid’s Tannochside store saw local environmental groups including Uddingston Pride, Brighter Bothwell and Bonnie Blantyre get involved in both a photocall and a litter-pick in a local park. The partnership will see 12 Scotmid stores from Brechin to Dumfries serve as community hubs for the duration of the campaign, which is running from April to May 2019. The hubs will have a Clean Up kit that supporters can use to carry out a Clean Up event in their community and will also have guidance on how to organise a Clean Up. Supporters will be encouraged to visit the hubs to use the Clean Up kit and carry out a local litter pick. Scotmid was founded with the core purpose to serve local communities and improve people’s everyday lives. By sponsoring the Keep Scotland Beautiful annual Spring Clean, Scotmid will be supporting the voluntary efforts of people nationwide to improve the local environmental quality of the places they live in and care for. Shirley MacGillivray, Scotmid Deputy Secretary, said: “Scotmid are really excited about supporting Keep Scotland Beautiful’s Spring Clean campaign – the initiative matches our core values and principles as a responsible community retailer. “As a co-operative, our main purpose is to serve communities and improve people’s everyday lives and, by reducing the amount of litter, we can take a positive step towards achieving those goals. “We acknowledge that achieving a cleaner Scotland will be a real team effort, which is why we’re proud that our stores will host hubs to enable our members, staff and customers to organise litter-picks in their local communities. The Spring Clean campaign is a key part of the wider Clean Up Scotland Campaign, which has been led by Keep Scotland Beautiful since 2012. Derek Robertson, Chief Executive of Keep Scotland Beautiful, commented: “In the years since Clean Up Scotland was launched, people across the length and breadth of Scotland have helped to remove a significant amount of litter from their local communities. We are very proud of their hard work and extremely grateful to Scotmid Co-operative for signing up to support the campaign. Further information about Keep Scotland Beautiful’s Spring Clean campaign can be found at www.keepscotlandbeautiful.org/cleanupscotland. Bishopmill, Nairn, Brechin, Kilmarnock, Bishopbriggs, Clydebank, South Queensferry, Roslin, Bonnybridge High St, Tullibody, Tannochside Uddingston and Dumfries. When can community groups obtain the litter-picking kits? Middle of March 2019; contact membership@scotmid.co.uk if your group are planning a #SpringClean19 litter-pick, so Scotmid can help co-ordinate and manage. Image (left to right): Scotmid store manager Campbell Lochrie, Keep Scotland Beautiful Community Projects Officer, Heather McLaughlin, Semichem Regional Business Manager Scott Ballantyne, North Lanarkshire Councillor Michael McPake, Keep Scotland Beautiful Finance and Corporate Services Director Catherine Gee, Scotmid Board Member Kaye Harmon, Scotmid Deputy Secretary Shirley MacGillivray.